Monster Hunter: World Trailer, Coming to PS4 Early 2018 | Nerd Much? Sony has announced Monster Hunter: World for the PS4, Xbox One, and PC, with a new trailer that claims the game will be coming to us early 2018 (a worldwide date). 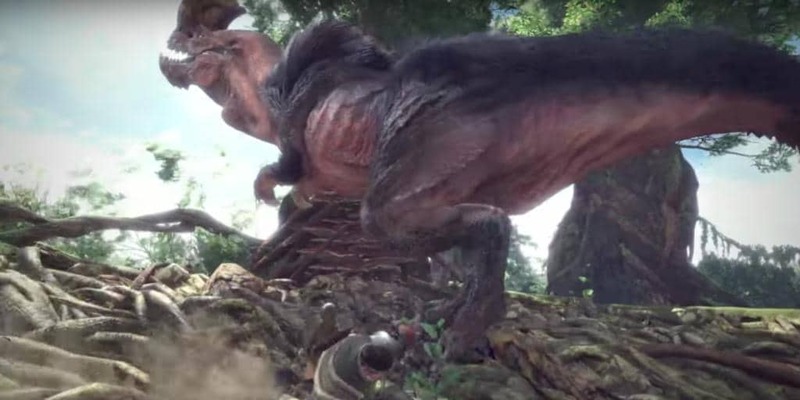 In this game, there is a “living, breathing ecosystem” that players take part in as a hunter of dinosaurs. You can have up to three hunters in one game in Capcom’s new online drop-in multiplayer, which works across regions as well between Japan and the West. The game will feature the same skill progression and crafting system so that players may hone their skills to their own tastes. Loot collected from monsters will help the player make their unique armor and weapons. The more you slay, the better your gear will be. Players can now move freely across the map areas of various ecosystems. The game also features a day and night cycle, affecting which monsters you’ll see out in the diverse landscape. Sometimes it’s good to engage, sometimes it’s a terrible idea, but it’s up to the player’s discretion. Luckily, you can use the environment to your advantage, if you need to make a quick get away, a low hanging branch can help, or perhaps there is a particularly flammable plant nearby. There will be exclusive PS4 content for Monster Hunter: World, though Capcom has no mentioned exactly what that will entail.